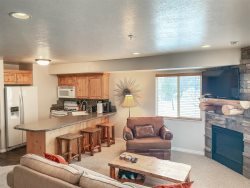 Newly Remodeled - Two Car Garage - NEW Private Hot Tub - Game Room - Near Ski Shuttle for Powder Mtn. NEW TO OUR RENTAL INVENTORY! This beautiful townhome offers 5 bedrooms 4.5 baths, newly remodeled with designer furnishings throughout and is ideal for multiple couples and large families, offering three different living levels and double Master Suites. The main floor gourmet kitchen includes a small bar area for extra seating or serving station which flows into the vaulted living room with large gas fireplace , large TV and French doors opening to a deck with stairs down to the private hot tub. The beautifully appointed main level Master Suite offers a king bed and private en-suite bath with Jacuzzi tub. There’s an attached two car garage. On the upper level is an additional Master Suite with a Queen bed, gas fireplace, TV, wet bar, small fridge, and its own full bath with jetted tub and separate shower. Also upstairs is an additional bedroom with a (2) twin beds adjoined by a cozy loft which you can find another day bed with twin trundle, a small office with desk, high speed wireless wifi and another full bathroom. The laundry facilities are also on this upper level. The lower level features a game room with a 55' TV, shuffleboard and arcade game that has 60 options for hours of family fun, gas fireplace, and French doors that access the private patio and secluded hot tub. You’ll also find two additional bedrooms, one with a queen and the other with a full which are adjoined with a jack-n-jill bath. The media room features a large screen TV with oversized sectional for multiple seating. Private Hot Tub off back patio, steps to the community clubhouse - fitness center and game room, excellent location!